In 2002, Alex Pang of the Institute for the Future published a book called Empire and the Sun: Victorian Solar Eclipse Expeditions. 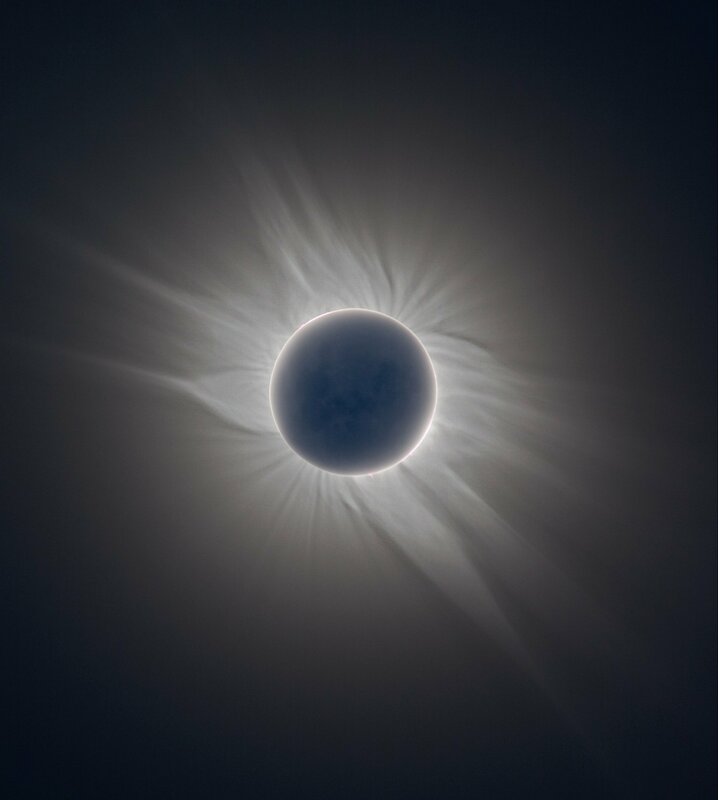 [Image: Stellar depression, or a total eclipse of the sun; from an astrophotography site]. Victorian eclipse expeditions established “eclipse camps,” or instant cities geographically calculated to lie exactly on the forthcoming path of totality. This was, we might say, urban planning as a function of astronomy; or, solar cycles dictating city form. 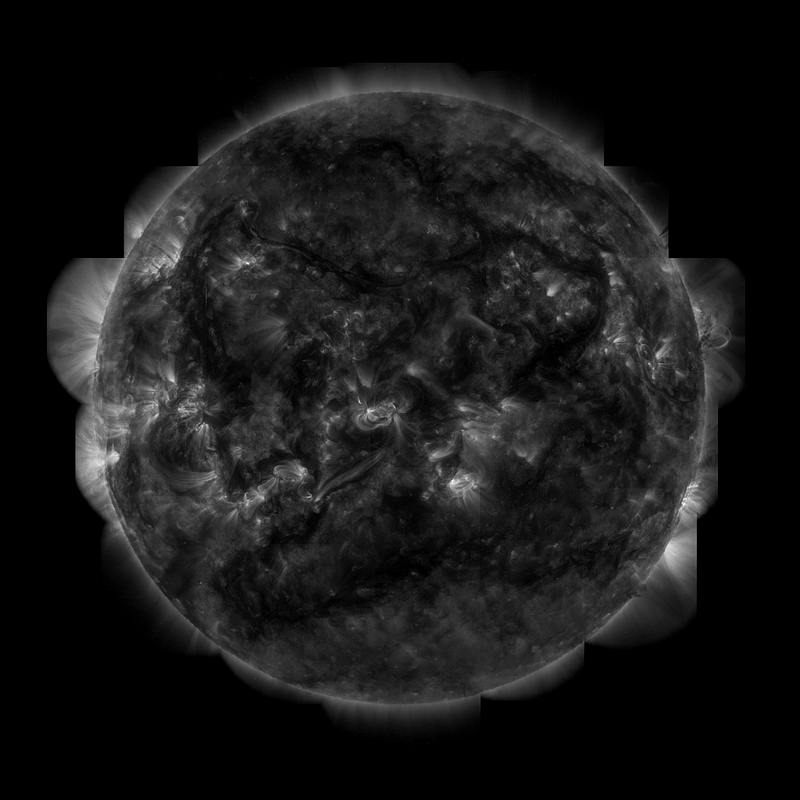 Observations here could be made of the temporarily extinguished sun, a black star shining over regions so remote they were often entirely unpopulated. On the other hand, Pang writes, locations close to railways were always preferred, as “a small town, easily accessible by railroad, with clear observing conditions and no clouds or dust,” could forestall the inconvenience of camping in the middle of nowhere. It was here, within this slim zone of moving darkness, spheres of heaven casting shadows on the earth, that an eclipse camp could be established. [Image: A solar eclipse as seen from space; photographed by Mir]. Battling cobras, tigers, cholera, and sunstroke—”less fortunate parties” even faced “epidemics” and “small wars,” perhaps suggesting Indiana Jones and the City of Eclipses—these expeditionary eclipse observers soon established a “standard form” for the camps. Every camp had shelter for instruments and baggage, and a darkroom for developing photographic plates. Observers setting up in monasteries [like monks contemplating a black sun, or the eclipse as solar adversary], villas, or estate gardens simply occupied existing buildings, while in unsettled areas, tents or huts were erected, and brick foundations and pedestals built. Eclipse stations were also easily identified by the temporary observatories that parties built. These buildings were usually rectangular, and built of wood on a brick or stone foundation; they housed the larger and more valuable telescopes, spectroscopic cameras, and darkroom, and appeared everywhere between Iowa City and Africa. [Image: A map of solar eclipses projected, amazingly, for 2981AD-3000AD; many, many more maps at NASA’s World Atlas of Solar Eclipse Paths]. [Image: A solar eclipse, from this MIT photo collection]. In any case, at least two quick things interest me throughout all of this: 1) Are there any examples of eclipse camps that, once the eclipse was over and gone, did not disband, becoming, over time, fully functioning towns or cities? What marks, if any, did that astronomical origin leave in the urban fabric? 2) Given loads of money and a huge amount of land, could you build a railroad that extends for hundreds of miles down the center of a future eclipse path – even an eclipse that isn’t due for decades, or perhaps hundreds of years? You ride from LA to Chicago, or Istanbul to Munich, Beijing to Bangkok, unaware that the skies will turn black along that very route, the train windows will darken, your passage across the earth will enact a moment of astronomy? It’s a pilgrimage route for manic depressives, industrially sprawled across the planet. [Image: From the BBC. What unearthly flowers would grow by the light of a suicidal sun?]. Mexico City could be considered an eclipse city, built on ruins of a stargazing civilization . Much better picture of an eclipse. 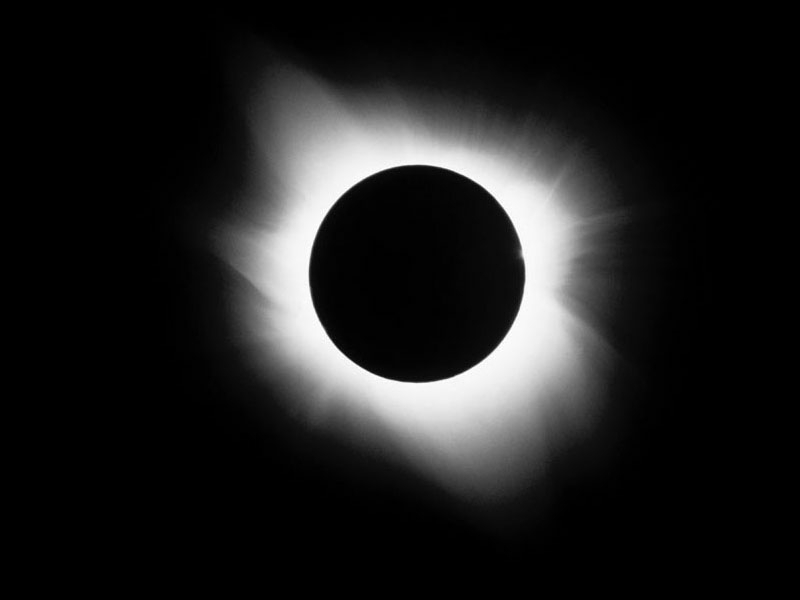 Xenmate: unfortunately thats not a 100% total eclipse, its a bit annular, it clearly shows the moon smaller then the sun. With a 100% total eclipse, both are exactly the same size. After seing both kinds of eclipses, i think watching a total eclipse is much more fun. I stand to be corrected then.